The Blue Zones Project™ is a community well-being improvement initiative designed to make healthy choices easier through permanent changes in environment, policy, and social networks. By helping people live longer, better through behavior change, communities can lower healthcare costs, improve productivity, and boost national recognition as a great place to live, work, and play. 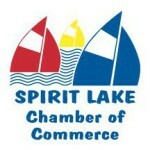 Spirit Lake has been designated as a Blue Zones Community. Move Naturally. Be active in everyday life, without having to think about it. Take the stairs, bike or walk to work or the store. 80% Full. Be conscious of how you feel when you’re eating and stop when you are 80% full. Plant Slant. At each meal, try to cover half your plate with plant-based items. Wine at 5. If you have a healthy relationship with alcohol, drink 1-2 glasses of wine daily. Purpose Now. People who wake up every morning knowing their purpose live 7 years longer than those who don’t! Down Shift. Find time to meditate, nap, pray, or enjoy happy hour. Belong. Be a part of a spiritual community. It feeds your soul and increases your longevity. Put Loved Ones First. Make family a priority. Set aside time each day to connect with your loved ones. Right Tribe. Create a healthy social network. Like-minded people encourage each other to make healthy choices. Community Policy Strategy. Through community organizations, government and individuals, policies are developed and activities undertaken to provide a more livable community. School Strategy. Stakeholders in schools develop methods to make schools healthier and safer. Restaurant/Grocery Store Strategy. These businesses develop menus, revised product placement, and take other steps to encourage healthier eating. Worksite Strategy. Employers work with employees to encourage healthier work environments.